Last week DNA Info reported that just about every Pie Face location has shut down in the entire city, including the four in Midtown. They sprouted up like hotcakes over the two years and have now shuttered just as fast with no explanation. There’s no clue on their website as to why they closed (or that they even are indeed closed). But no doubt they expanded too quickly and NY’ers were just not ready for a full-on Australian meat pie chain! The only one still open is just out of bounds on 36th and Ninth. Posted by brianhoffman at 12:00 pm, October 22nd, 2014 under Pie Face. Posted by Rachel Goldner at 11:00 am, November 18th, 2013 under Pie Face. Free Pie Face Alert: Looks like this is becoming a monthly occurrence! Once again, it is free pie day at Pie Face. This time, from noon until midnight they're giving away free mini mince beef pies in exchange for social media posts. Just be sure to tag them on Instagram, Facebook or Twitter. Find the nearest location to you here. Free Pie Face Alert: Last month, Pie Face ran a promotion trading your social currency for a meat pie. The Aussie franchise is at it again, this time giving away free mini tandoori vegetable pies today (Tuesday) between noon and midnight. All you have to do is show them some love by tagging them on Twitter or Instagram, or by posting on their Facebook wall, and showing your post at any of their locations to receive your freebie. 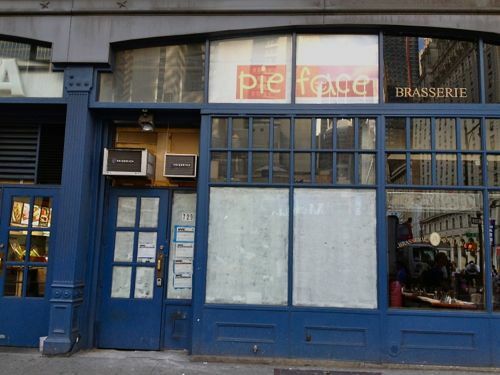 Yet Another New Pie Face Coming To Midtown West? If 2012 was the year of the Pot Belly expansion, 2013 certainly seems to be the year of the Pie Face takeover of Midtown. The Aussie pie and flat white franchise seems to be opening yet another location in Midtown West. The familiar signage popped up over a storefront at 729 8th Avenue, between 45th and 46th streets. No word on an opening date yet. Posted by Rachel Goldner at 1:30 pm, August 16th, 2013 under Pie Face. Free Pie Face Alert: From noon until midnight today Pie Face is trading your social currency for a meat pie. Show them some love by tagging them on Twitter or Instagram, or by posting on their Facebook wall, and show your post at any of the Midtown locations to receive a free mini BBQ pulled pork pie. With all of their locations situation nicely in Midtown, hopefully there's a Pie Face near you so you can take advantage of the deal! 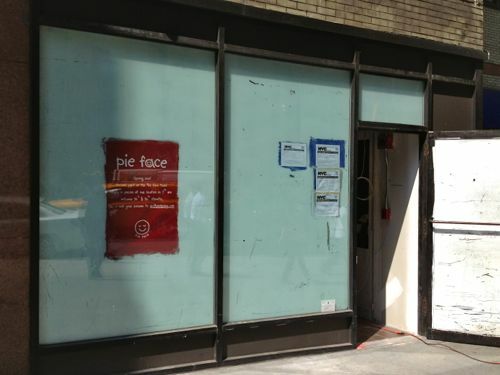 Pie Face seems to cropping up in Midtown like hungry dingoes around a nursery. We’ve seen a bunch of them come up over the last year or so, and now that their newest location on 9th and 36th is open it’s high time we gave them a look beyond breakfast food and giant morasses of mashed peas, potatoes, and gravy over a meat pie (can you GET any more British Commonwealth chow than this?). On their first weekday open, running 24-7-365, can they carry a tune when it comes time to Pie Face the music? Posted by MJP at 11:30 am, July 30th, 2013 under Pie Face. 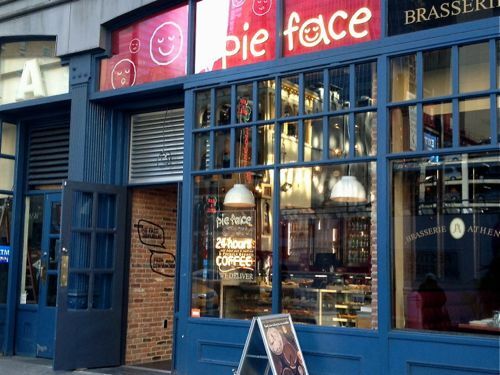 Crikey, Pie Face is coming to South Hell’s Kitchen! If their locations scattered across Midtown didn’t do it for the out-of-bounders like myself, then rest assured – Pie Face has you covered. On a photorecon run up 9th to check out the shell of Ranchito del Agave, the sight of a brand-new commercial oven in front of the above-pictured construction shell at 464 9th Ave (at 36th St.) occasioned a quick chat with the construction guys out front. The new Pie Face popped up in real estate press late last year and the construction should be finished next week. No word on grand opening dates yet, but keep your eyes peeled for our forthcoming coverage of even more fair dinkum meat pies and flat whites. Posted by MJP at 2:38 pm, May 20th, 2013 under Pie Face. 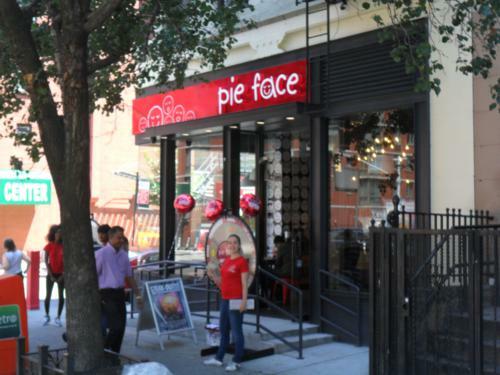 New Pie Face Opens Today: The new Pie Face location at 1407 Broadway (btw 38+39) we wrote about last week opens today. In fact, they teamed up with Motown: The Musical, to launch a new limited edition summer berry pie (inspired by Motown founder and music mogul Berry Gordy), which will debut at this new location. As we've come to expect, there will be a prize wheel with opportunities to win free pies, coffee and dessert, and they'll be handing out free samples near the store. Pie Face is expanding quickly! Lunch’er Mike alerted us to a new location under construction on Broadway between 38th and 39th streets. Sure enough, just a few blocks from the relatively new shop on 7th Avenue between 35th and 36th streets, there’s a help wanted sign in the window with the signature smiley pie face logo. Who’s quitting their day job to serve some flat whites and pies? Posted by Rachel Goldner at 1:30 pm, April 11th, 2013 under Pie Face.